To Cite: Junjun J, xuelian Z, Dhruba K, Haiyang X, Lin Z, et al. Efficacy of Preoperative Chemotherapy in Treatment of Children With Wilms’ Tumor: A Meta-Analysis, Iran J Pediatr. 2015 ; 25(2):-. doi: 10.5812/ijp.366. Context: To assess the efficacy of preoperative chemotherapy in Wilms’ tumor patients and explore its true value for specific subgroups. Objectives: In the presence of these controversies, a meta-analysis that examines the efficacy of preoperative chemotherapy in Wilms’ tumor patients and specific subgroups is needed to clarify these issues. The objective of this meta-analysis is to assess the efficacy of preoperative chemotherapy in Wilms’ tumor patients and explore its true value for specific subgroups. Data Sources: Computer-based systematic search with “preoperative chemotherapy”, “Neoadjuvant Therapy” and “Wilms’ tumor” as search terms till January 2013 was performed. Study Selection: No language restrictions were applied. Searches were limited to randomized clinical trials (RCTs) or retrospective studies in human participants under 18 years. A manual examination of references in selected articles was also performed. Data Extraction: Relative Risk (RR) and their 95% Confidence Interval (CI) for Tumor Shrinkage (TS), total Tumor Resection (TR), Event-Free Survival (EFS) and details of subgroup analysis were extracted. Meta-analysis was carried out with the help of the software STATA 11.0. Finally, four original Randomized Clinical Trials (RCTs) and 28 retrospective studies with 2375 patients were included. Results: For preoperative chemotherapy vs. up-front surgery (PC vs. SU) group, the pooled RR was 9.109 for TS (95% CI: 5.109 - 16.241; P < 0.001), 1.291 for TR (95% CI: 1.124 - 1.483; P < 0.001) and 1.101 for EFS (95% CI: 0.980 - 1.238; P = 0.106). For subgroup short course vs. long course (SC vs. LC), the pooled RR was 1.097 for TS (95% CI: 0.784 - 1.563; P = 0.587), 1.197 for TR (95% CI: 0.960 - 1.493; P = 0.110) and 1.006 for EFS (95% CI: 0.910 - 1.250; P = 0.430). Conclusions: Short course preoperative chemotherapy is as effective as long course and preoperative chemotherapy only benefits Wilms’ tumor patients in tumor shrinkage and resection but not event-free survival. Wilms’ tumor, also known as nephroblastoma, is one of the most common solid tumors in children, the morbidity is 7.8 per million (1, 2). The cure rate attained in children with Wilms’ tumor has been dramatically improved during the last three decades because of the multidisciplinary approach of combined surgery and multi-drug therapy, and use of radiotherapy (RTH) when necessary. The latest report showed the five-year event-free survival (EFS) and overall survival were 77.2% and 87.5% (3). Though there are large leading international organizations focusing on the Wilms’ tumor such as SIOP (the International Society of Pediatric Oncology) and NWTSG （the National Wilms’ Tumor Study Group), they have different opinions regarding the administration of preoperative chemotherapy. The NWTSG advocates up-front resection of the primary tumor before chemotherapy is given. In contrast, SIOP recommends the administration of chemotherapy before surgery. What’s more, the short course before surgery was proposed to further reduce the toxicity but the efficacy was still debated (4, 5). In the presence of these controversies, a meta-analysis that examines the efficacy of preoperative chemotherapy in Wilms’ tumor patients and specific subgroups is needed to clarify these issues. The objective of this meta-analysis is to assess the efficacy of preoperative chemotherapy in Wilms’ tumor patients and explore its true value for specific subgroups. The aim of this meta-analysis was to collect all available data from clinical trials of preoperative chemotherapy in the treatment of Wilms’ tumor. 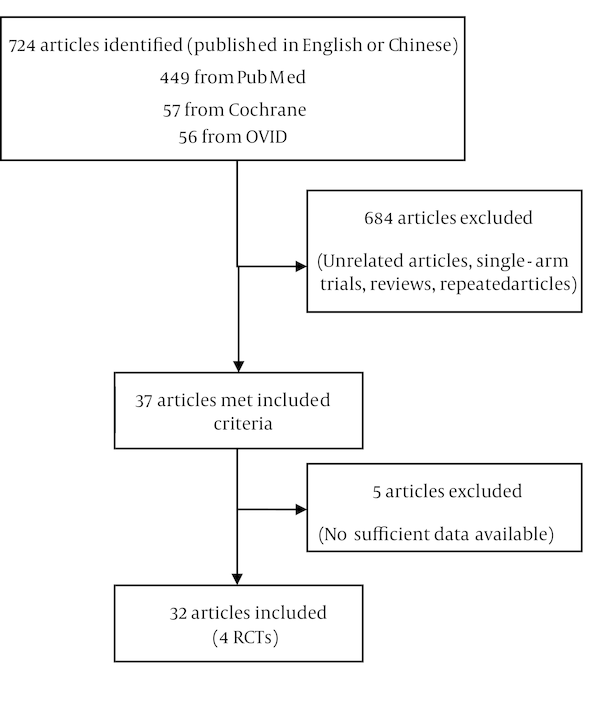 A computer-based systematic search in PubMed (MEDLINE), Cochrane, OVID (including EBMASE and biosis previews database), VIP, CNKI and WanFang databases before January 2013 with “preoperative chemotherapy”, “Neoadjuvant Therapy” and “Wilms’ tumor” as search terms was performed for possible clinical trials. No language restrictions were applied. Searches were limited to randomized clinical trials (RCTs) or retrospective studies in human participants under 18 years. A manual examination of references in selected articles was also performed. Studies were eligible for inclusion in this meta-analysis if they met the following criteria: I) the design of the studies was RCTs or retrospective studies, II) the preoperative chemotherapy (PC) should have been contained in the research group, whereas up-front surgery without preoperative chemotherapy (SU) in the control group. Or in subgroups, short course (SC, between 2 - 4 weeks) of preoperative chemotherapy has been contained in research group, while long course (LC, more than 4 weeks) in the control group, III) at least one of these endpoint indexes indicating that Tumor Shrinkage (TS), total Tumor Resection (TR) and Event-Free Survival (EFS) were available in the study, IV) the patients should have suffered from Wilms’ tumor. Duplicated Reports and Case Reports Were Excluded. The quality of selected RCTs was assessed according to the criteria presented in the Cochrane Handbook for Systematic Reviews of Interventions (version 5.0; Chapter 8) (6). Details include random, allocation concealment, Intension-to-Treat (ITT), drop-out and bias risk. Study characteristics, patient details, total number of patients in each trial, Relative Risk (RR) and their 95% Confidence Intervals (CI) for Tumor Shrinkage (TS), total Tumor Resection (TR) and Event-Free Survival (EFS) were extracted. We also contacted authors of some undergoing studies for data updates and statistical details. TS was defined as at least a 30% decrease in the sum of the longest diameter of target lesions with radiological assessment according to the Response Evaluation Criteria in Solid Tumors (RECIST) (7), TR was defined as no residual tumor with naked eyes according to the improved Shamberge criterion, and EFS was defined as no evidence of recurrence and metastasis during two-year follow up. For studies that provided an effect estimate such as Relative Risk (RR), the study-provided effect estimate was directly used in the pooled meta-analysis calculations. For studies that published number of events but did not provide an effect estimate, this information was used to calculate the RR of each outcome for the intervention compared with the placebo group. We logarithmically transformed the RR and corresponding standard error to stabilize the variance and normalize the distribution. We calculated the overall pooled-effect estimates using inverse-variance weighting to calculate fixed-effects models (8). The Q test was used to assess the presence of heterogeneity and the I-squared index to quantify the extent of heterogeneity (9). To assess for publication bias, we constructed funnel plots for each outcome in which the ln (RR) was plotted against its standard error. The Begg’s rank correlation test was used to examine the asymmetry of the funnel plot (10). All analyses were conducted in STATA version 11.0. Our search strategies led to collect 724 articles from the published reports. After reviewing each publication, we identified four original RCTs and 28 retrospective studies (among which 13 studies were written in Chinese) with 2375 patients that met our criteria (Figure 1). There are few RCTs about the preoperative chemotherapy of Wilms’ tumor, even less about the short course chemotherapy. Meanwhile, several retrospective studies presented meaningful results about these issues; thus, discarding these data would be unwise. The study, intervention, population, quality assessment of RCTs is summarized in Table 1. The progress in treatment of Wilms’ tumor is one of the greatest achievements in oncology for the last three decades. Modern treatment regimens yield overall survival rates of 87.5%, and this success has precipitated a shift in emphasis on reducing treatment related toxicity. Although North America and Europe have different philosophies on preoperative chemotherapy, both treatment approaches yield excellent clinical outcomes (41). The SIOP strategy of giving preoperative chemotherapy is based on the premise that it usually reduces the tumor volume, thereby decreasing the likelihood of spillage, “downstaging” the tumor and improving the tumor resection (42). Our meta-analysis focuses on this premise and related indexes, the pooled RR for TS, TR in our meta-analysis are 9.109 (95% CI: 5.109 - 16.241; P < 0.001; I2 = 0%) and 1.291 (95% CI: 1.124 - 1.483; P < 0.001; I2 = 22%), representing that the chance of tumor shrinkage is nine times higher and the chance of total tumor resection is 1.3 times higher in patients with preoperative chemotherapy compared to the patients with up-front surgeries. On the premise of SIOP previous data and its treatment regimen, this study yields slightly variable outcomes in the prospective of preoperative chemotherapy in the patients with Wilms’ tumor, as the pooled RR for EFS in this study is 1.101 (95% CI: 0.980 - 1.238; P = 0.106; I2 = 0%), indicating no statistical difference in the case of Wilms’ tumor recurrence or metastasis after surgery in the patient with preoperative chemotherapy and up-front surgery, which concludes that whether preoperative chemotherapy is given or not, both approaches yield same clinical outcomes after may provide a valuable prognostic indicator (43). Some problems also should be noticed, the most relevant one is reported by SIOP 93 - 01 that approximately 5% of lesions in patients treated with preoperative chemotherapy were ultimately shown not to be Wilms’ tumor and included 1.8% benign tumors (44); there is considerable hematological toxicity and treatment-related mortality in malnourished children, for whom reduced doses should be considered (45). The other important consequence is, certain chemotherapeutic agents such as doxorubicin, dactinomycin, and vincristine may contribute to an increased risk of secondary malignancies. Fifteen years after initial diagnosis, the cumulative incidence of a secondary malignant neoplasm in patients registered with NWTSG was 1.6% and increasing. Further study is required to validate these facts. In 2001, Tournade et al. (5) reported that preoperative chemotherapy with vincristine and dactinomycin for four weeks was as effective as for eight weeks in localized Wilms’ tumor. According to this conclusion, short (2 - 4 weeks) course of preoperative chemotherapy was proposed, which reduces the outcome of therapeutic toxicity. The pooled RR for TS, TR, EFS in our study respectively are 1.097 (95% CI: 0.784 - 1.563; P = 0.587; I2 = 0%), 1.197 (95% CI: 0.960 - 1.493; P = 0.110; I2 = 0%) and 1.006 (95% CI: 0.910 - 1.250; P = 0.430; I2 = 0%) for subgroup SC vs. LC. Though there is a tendency to increase TS and TR compared to LC group, the differences are not statistically significant. The short course therapy was as effective as conventional intravenous chemotherapy (4 - 6 weeks duration, SIOP recommends). Also, our results are intact with the SIOP (9). The mechanism may be associated with the drug-resistance, which is associated with multidrug resistance-associated protein (MRP). It has been shown that the tumor shrinks remarkably during second-third week of preoperative chemotherapy while after the fourth week there could be a tendency of the tumor size to increase because of the MRP expression. There are also some limitations in our meta-analysis: the studies included are 19 English and 13 Chinese, publication bias could not be ignored; the studies included are not all RCTs, the retrospective studies also cause bias in methodology; histological characteristics and stage levels also play an important role in the prognosis of Wilm’ tumor but we did not include these factors in the study. Apart from these limitations, we carried out the first meta-analysis on preoperative chemotherapy and its subgroup with the largest patient number. In summary, our meta-analysis shows preoperative chemotherapy benefits Wilms’ tumor patients in tumor shrinkage and resection but not event-free survival. Meanwhile, the efficacy of short course chemotherapy is similar to long course chemotherapy. In other words, short course chemotherapy can be offered as an effective and safe alternative treatment modality for Wilms’ tumor. But the patients included in SC groups are few; further study with more RCTs and large scale patients are needed to overcome the limitations that existed in this study.